At first glance, you may not be able to identify the differences between these Keurig models. It’s because they look identical and both have elegant styles. 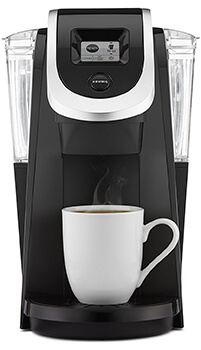 Nonetheless, the K250 version is an updated version of the Keurig 2.0 K200. So, it’s supposed to have better features. Accessories.The K250 model has more accessories than K200 model. The K250 has 2 charcoal filters, 4 water K-cup pods, 1 water filter handle, and 1 bottle of Keurig descaling solution. On the other hand, the k200 has only 1 water filter and 1 filter handle. Brewing Time. The K200 has a longer brewing time of more than a minute, while the K250 brews in less than a minute. Water Filtration. With regards to water filtration, the k200 version doesn’t have this feature, while the K250 have this feature. Price. The K250 model is more expensive than the Keurig K200. The comparison chart below will help you find out more information about the similarities and key differences. Water Reservoir 40 oz. 40 oz. Cup Size Cup sizes of K-Carafe brew, K-Cup and K-Mug - up to 30 oz. Cup sizes of K-Carafe brew, K-Cup and K-Mug - up to 30 oz. Customers have given the K200 favorable reviews. This can be attributed to its reliability, durability, key features and sterling performance. LCD touch screen for easy use and customization. Provides strength and high altitude capabilities. Has the same key features as the K250 version. Users have awarded the K250 model more than 4 star review recommendations too. The accessories made all the difference from its Keurig predecessor. Comes in classy design and colors. Provides strength and high altitude controls. Easy customization because of LCD touchscreen. A few consumers complained about the plastic smell. N.B. The plastic smell was solved by washing and soaking the parts of the coffee maker in white vinegar. If the smell persists, you could contact support services. But enterprising users have worked it out on their own. This is one of the few hiccups that buyers complained about. Overall, the advantages significantly outweigh the disadvantages. Therefore, you will get your money’s worth from these two Keurig brewing models. The advantage of the Keurig K200 vs K250 is its price. First one is less expensive. K200’s disadvantage is its lack of accessories. On the other hand, the increased price of the K250 is its disadvantage, and the added accessories are its advantages. With this model, you can brew coffee more quickly and conveniently due to the added accessories. These accessories are not provided with the K200 model. If you want them, you will have to buy them separately for the K200. In a nutshell, the difference between Keurig K200 vs K250 lies in the price and the accessories. In instances when you want the complete package, you may prefer to purchase the K250 coffee maker. Additionally, the price is not exorbitant, so you can add a few dollars to the price of the K200 for the upgraded K250 version. In comparison with other brands, the Keurig series can boast of their LCD display, touch screen and auto-off functionality. These features set Keurig K200 and K250 apart from other brands. You can go over the pros and cons of both Keurig models below to learn additional information about the performance of these coffee makers. 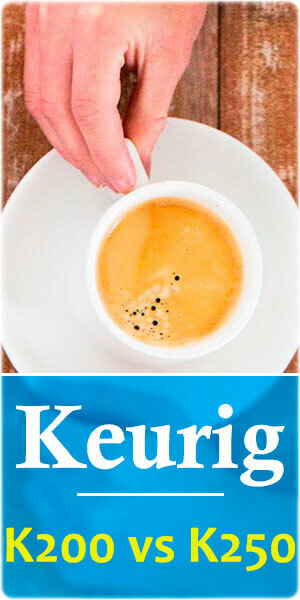 Related: What’s the Difference between Keurig K425 and K475? The key features of these devices are similar. So, you may be wondering why the K250 is more expensive than the K200. You can compare the difference between the two brewing machines by going over the chart above. Additionally, we have compiled the key features of both coffee makers to help you select which model is the best for you. Auto-off. This excellent feature allows the coffee maker to auto shut off when the coffee has been brewed per specifications. This is present in both the Keurig K250 and the K200. This feature is convenient in busy offices when time is gold and no one is required to wait to shut off the system. However, the brewing system of the machine does not have an auto on, so you have to turn it on first. Water Reservoir. The capacity of the water reservoir is the same for the Keurig k200 and K250. Both models can contain up to 40 ounces of water. The reservoir is removable, so you can easily replenish its content. Shorter Brewing Time. There’s a difference between the brewing time of the Keurig 200 vs K250. The K200 need more time than the K250. The K200 coffee maker may brew after more than a minute, while the K250 brews within a minute. This may be considered insignificant to other coffee aficionados but to users who value every second of their time, this is an essential feature. Nevertheless, both the K200 and K250 brew coffee within minutes only. Unlike other brands that could brew within a longer period of time. Furthermore, they are both compatible with over 60 brands and contain 4 K cup sizes. Aside from coffee, the K250 coffee maker can also brew hot cocoa and tea. I like this awesome feature as it allows me to drink a decent cup of coffee, hot cocoa, or tea alternately. Indicator Lights with Touch Screen Control. You can customize the coffee maker to control its strength and high-altitude specifications. The touch screen and indicator lights would make the task easier for you. There are less buttons to deal with. You could operate these models in dark places too, as the indicator lights would provide the visibility you need. Both coffee makers are compatible with K-Mug, Keurig 2.0 K-cup pods, Keurig 2.0 reusable, K-Vue, My K-cup, and K-carafe pods. Both these models have 9 brew sizes. Hence, it’s easy to brew coffee any time you want. The Keurig coffee makers were both awarded more than 4-stars from customer reviews. This indicates that these models have lived up to their advertising promises. The most important function that they should deliver is to brew coffee efficiently. Both options have performed well in this category. You just have to go over the reviews to find out if the coffee maker is, indeed, performing well. Majority of reviews recommend both brewing machines. A steaming cup of hot coffee in the morning is one of the best ways to start your day. Your Keurig Plus Series brewer could serve your cup of hot, savory coffee. The coffee taste is top-notch and the brewers bring out the best from it. Whether you prefer a single-serve or multiple cups, it’s your prerogative as the coffee drinker. 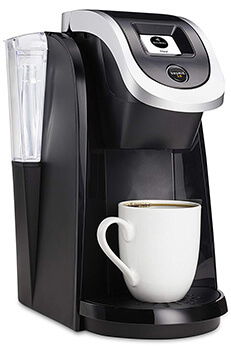 Based on the key features and accessories of the Keurig coffee makers, they are both dependable and efficient. They both received high marks from customer reviews for their performance. Furthermore, they are durable and made of high-quality materials that verified Keurig users have attested to. The K200 and K250 could also provide incredible features that you would love to have in your own coffee maker. Considering all these features, pros and cons, we recommend the Keurig 250 coffee maker. This is my personal choice as well. This is because, initially, it may appear to be more expensive. But in the long run, it would be the best price for the Keurig coffee maker set. This has something to do with its incredible accessories. Although the price of the K250 model is a little bit more expensive, you could actually buy the additional accessories at a discounted price, as they come with the Keurig coffee maker package. With the Keurig 2.0 K200 model, you have to purchase these accessories separately. That could be more inconvenient and more expensive, when you add up the total cost. Nevertheless, if you’re in a tight financial bind, but you want to buy a coffee maker urgently, you can purchase the K200. And then, through the course of time, you can buy the brewing machine’s accessories. Either way, the final choice is yours. Hopefully, we have provided the information to help you decide what could be the best coffee maker that is suitable for your preferences and lifestyle.